This chapter reviews some hardware and software for digital soil mapping. By hardware we mean various kinds of sensor and instrument which can give us better soil and scorpan data, and by software we mean mathematical or statistical models that can improve our spatial predictions. There are two approaches for the development of hardware for acquiring soil information: the top-down, and the bottom-up. The top-down approach asks which technologies are available and which variables can we measure that are related to scorpan factors. The bottom-up approach starts from a problem that we systematically analyse so as to identify the information that is needed to solve it. We then tackle the technical problems of collecting this information, and only at the end move to developing the field technology. We evaluate various software approaches to improve spatial prediction of soil properties or soil classes. 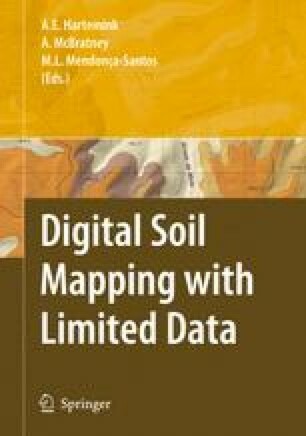 Finally, the implication of using data-mining tools for the production of digital soil maps is discussed.